He was a mere two shots from being included in one of the great Australian Open playoffs at Royal Sydney on Sunday. 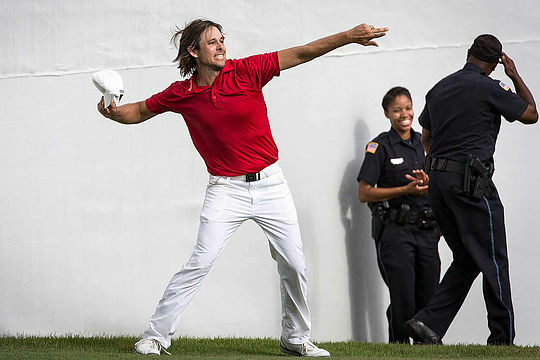 If that didn’t prove Aaron Baddeley still has the fire in the belly, then how about this? The now US-based Victorian still feels he could be the No.1 player in the world. And ‘Badds’ feels the way his game is progressing that it is entirely ‘do-able’. “People can think: ‘hey, that’s a bit crazy’ but honestly I think it’s very attainable and I’m excited,” Baddeley explained as he prepared to tee it up with the likes of eventual winner Jordan Spieth and top-10 player Adam Scott at Royal Sydney, where Baddeley won the Open as an amateur in 1999. Baddeley proved he just might be on the right track when he broke a five-year drought on the US Tour this year and regained his card for the 2017 season. Now 35-years-old (he won the first of his two Australian Opens at just 19), Badds might only be ranked 149 in the world, but suggested he could still go all the way to the top of those rankings. Baddeley said these days he had a couple of swing keys that he worked on all the time and he was “beyond relaxed” with his game and where it was at.